This week we got further clarification that the RBA is firmly on hold but the market still isn’t buying it. Deputy Governor Guy Debelle went to great length to outline the RBA’s current thinking on the outlook for the economy and in turn monetary policy when he spoke earlier this week. He was rather candid on the current dilemma that faces the RBA in working though the inconsistencies in the data and how it might impact their ability to meet their mandate. As it stands employment is the key to the outlook and unless unemployment starts to rise, the RBA will be reluctant to provide more support to the economy via lowering the cash rate. That of course assumes that they still expect that inflation will trend higher over the medium term back into the target band of 2-3%. That makes the next two week critical to the near term outlook. Before we get to the Easter Break next week, we get the latest update on the employment market. While the unemployment rate dipped below 5% at the last update, the lowest read in a number of years, the growth rate in new jobs shows signs of fading. The market is next weeks data will show jobs growth picking back up. However the unemployment rate is expected to edge back up to 5%. One month doesn’t make a trend, so the RBA would need to see the unemployment rate tick up for a number of months before it would potentially trigger any action. After the Easter Break though we get the latest read on inflation. The RBA still expects that the tightening of the labour market will slowly lift wages and in turn help lift inflation back to the target band. While wages seem to have bottomed and are ever so slowly starting to rise, progress is slow. The core pace of inflation has been sitting under the RBA’s target band for a number of years despite the RBA’s persistent expectations that it will return to the target band. Should the RBA start to see signs that inflation is unlikely to make sufficient process in returning to the target band, then they may look to help it along, even if employment outcomes remain sound. After both of these key updates, the RBA will get a chance to update the market on their latest assessment at their May Board meeting before adding additional detail in their quarterly Statement on Monetary Policy that is due the same week. It will present them with the perfect opportunity to signal and change in the outlook if they deem necessary. 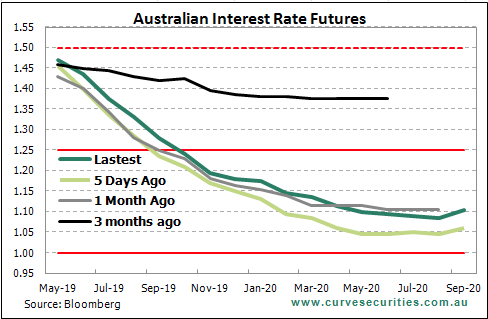 If the data prints ok over the next two week, I would assume we will hear more of the same from the RBA, giving them another three months of data and clarity over the fiscal outlook once the election has been run and won, before giving us their next major update in August.